The map shows the results at each location. Each circle at a location represents a different question asked in the Mijn Park app. The size of the circle represents the average score. If you click in the middle of the circles you see the actual average scores. Feeling shows people’s answers to the question ‘To what degree do you find this site…[tranquil, lively etc]’. Satisfaction shows people’s answers to the question ‘How satisfied are you with the presence of [Play = play equipment, Sports = sports facilities] at this site? How satisfied are you with the state of maintenance of [Garbage, Vegetation, Paths, Facilities] at this site? For a larger, layered map visit this page. Here the maps are layered and you can view the results for each variable independently. (Tip if viewing on your mobile: zoom in on the layers list until you can read them and click them on and off. then you can zoom in and out on the map itself as you wish. The legend is then not visible anymore, but how ‘redder’ the points how higher the score. And you can click on the point to read the actual average score. The ‘No. visits’ map shows the number of times each location has been visited and questions answered). 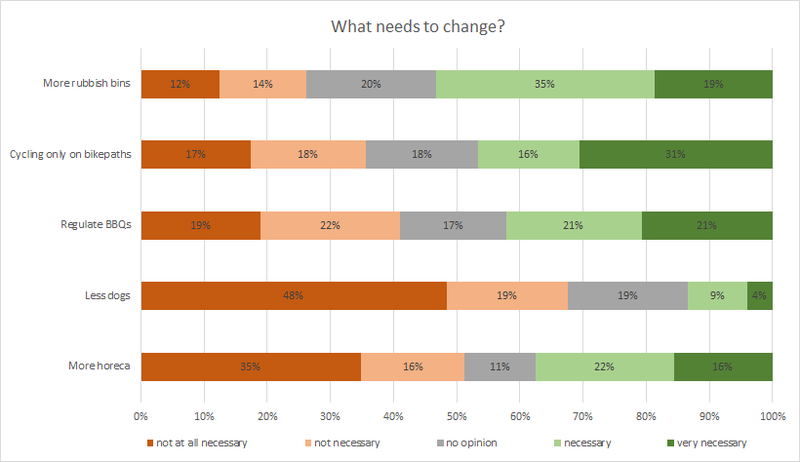 Change: This graph shows how people responded when asked how much they would like specific changes to take place in the Rembrandtpark. Satisfaction: This graph shows how people responded to questions about how satisfied they are with certain aspects of the park.